It’s hard to believe that eight years have passed since the sad Saturday when we received the tragic news from Berlin. 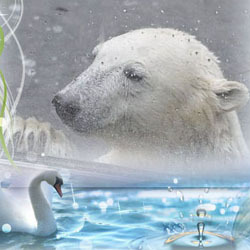 However, Knut’s spirit will always be with us! These photos were taken by Gudrun on the 6th of March 2008 when Knut was treated with carps. He was allowed to catch them himself. Nachdem bereits Elefantenkuh Tanja im Oktober 2018 über die Regenbrücke gehen musste, ist Iyoti ihr gestern gefolgt. Today we received sad news from the Tallin Zoo. Polar bear Nord had to be euthanized due to a bad wound in his paw. Despite of a long treatment and consulting expert veterians the wound didn’t heal. All photos of Knut are wonderful but maybe the ones taken in Winter time are something very special. After all – Winter is the polar bear season! 5.12.2018 – This story was first published 19.11.2010. Again many Knut friends are in Berlin to celebrate Knuti’s birthday. Unfortunaly I can’t be there due to illness but this is a special day anyway! This time I thought you would like to see some photos taken by Gudrun in 2008 when Knut was still ‘een kleenet Kind’. We miss him so much! Log in | 49 queries. 0.913 seconds.